I know Pesarat is an Andra specialty. Whenever we go to a restaurant in India, I never miss to see this item in the menu. But never have ordered this. To be frank, I have never tasted Pesarat until recently. If you are anything like me, I would really suggest you give it a try. I loved the taste and spiciness and couldn't stop eating. This is a very simple variation of dosa. The variation is on the way we prepare the dough and the most important thing is we need not ferment the dough. How convenient? we can eat it on the same day we crave these. Soak the rice and gram together for at least 6 hrs. Grind it to a dosa batter consistency with salt, green chillies,ginger and cumin seeds. Now in a Tawa, pour this batter and cook it in a medium flame. Make the dosa very thin and add the chopped onions and coriander leaves on top of it. Cook on one side. Do not turn. Wait till it is fully cooked and serve hot with any chutney of your choice. Note: If you want you can also add some chopped green chillies and ginger on top of your dosa to make it spicy. Sangeeth, why do they cook it only on one side? It sounds very healthy with more dal than rice in the batter, so this is definitely something I would want to try. I saw a recipe for pesarattu where they fill it with upma inside. I am not sure if this is a tradional way of doing it or improvised method. It was interesting. actually adding upma inside is a variation i guess. we cook it one side because we add some onions on top and if we turn then they will stick to the tawa. More over to get the pesarat crispy we cook it one side so it is better if we make the pesarat thin so that it gets cooked evenly. pesaratu looks delicious and crisp. I too make this often. How r u? I love pesarattu and upma, u got a nice brown color! I just love the way you make your meals look! We'd like to cook more Indian, but it's so hard to get the proper spices and ingredients. The closest really good Indian grocery store is about an hour's drive away. But I do still love looking at your recipes! Welcome back Sangeeth.lovely healthy recipe! Hey Sangeeth how have you been? Long time no see?? it is a good healthy recipe and easy to make. Good to greet you and read your innovative Ragi pudding. Can Idli rawa be used instead of rice for this recipe? If yes, then in what quantity? Hi, interesting post. I have been thinking about this topic,so thanks for posting. I'll probably be coming back to your posts. I really love indian food. Very colorful, tasteful and lots of seasoning and condiments. I loved that Dosa variation you have done. I have just started cooking and really wanna learn to make such delicious dishes you shared here.. So wonderful and refreshing. Love that dosa! Love the way you have pictured them! Fantastic! chutney is so yummy !!!.. i can't control myself as dosa is my favourite and I so excited to try this new flavoured dosa. nice recipe :) Thanks for sharing. Your blog is very nice and colourful.As usual, your food looks delicious! Wonderful!!! collection of recipe. Thanks for sharing. Its such as you learn my mind! You appear to understand so much approximately this, like you wrote the guide in it or something. I believe that you can do with some % to force the message house a little bit, however other than that, this is magnificent blog. A great read. I’ll certainly be back. My husband is a huge fan of Indian cooking, he does some himself but we also like to go to an East Indian restaurant we found recently where they have a lunch buffet - Buffets are perfect to try different things. I have not had Pesarat to my knowledge, I prefer the less spicy foods, which - lucky for me - the buffet does make things a bit less spicy than they normally would, but my husband loves the real spices, I will share your great recipe with him. Good blog enjoyed it. 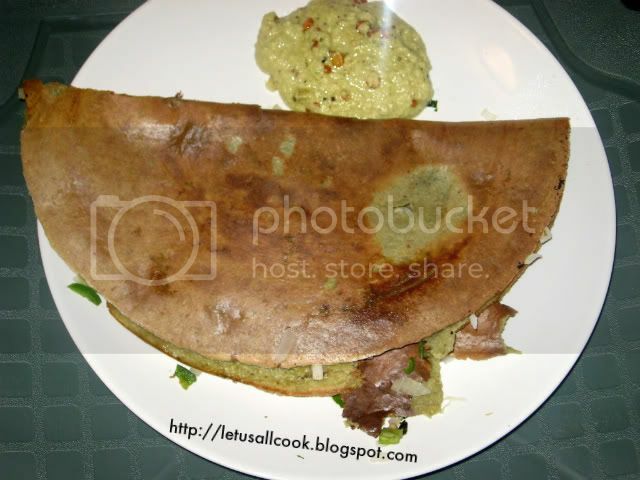 It has been interesting to prepare a Pesarat - A dosa variation.I have enough interest for creating it. I like this dish is to good. new type of Dosa Recipes is very nice. Good for Health. brown coular dosa is very yummmy. It looks like a tacos. This surely is spicy because Indians love spicy foods. I will definitely try this one. Calibration of equipment is not just desirable, it is rather a necessity .Keeping this idea in mind, Spectro research lab ventures’ provides complete calibration solutions with measurements of highest quality & precision.We also cater to On-Site Calibration services performed by highly trained staff designed for the convenience of our valued customers.